One of humanity’s biggest disgraces of the last half a century has been the apartheid imposed to Palestinians by Israel State. This, a first rate military power provided with the unconditional support of the US, the leading world power, has punished relentlessly civilian populations barely able to defend themselves. It has stolen their most basic natural resources [water access], has imposed military barriers in order to marginalize and control the Palestinians, and to regulate the entrance of food and people to the Occupied Territories, has destroyed many homes with its bulldozers and has established in the West bank many illegal settlements, condemned by international community, dwelt by violent ultra-orthodox settlers. To the land robbery, to the natural resources confiscation, to the subjugation of civilians to a permanent military state, it must be added the regular bombardments and shootings, with cutting-edge arms, against unarmed, helpless people. For all these actions, it is by no means an overstatement to call it a deliberate, systematic ethnic cleansing. A whole population is being wiped off the map. Israel’s power extends itself to the media, which usually give a very biased and umbalanced view of the so called Arab/Israeli conflict. They stress the particular terrotists atacks perpetrated by Palestinians, and minimize the coverage of the daily siege on Palestinians, as well as the killings in Occupied Territories. In some countries [as in United States and France], the complaints against the politics amount to accusations of antisemitism, of hatred against all the Jewish people. But many Jews all over the world [in Israel as well] deplore Israel’s aggressive, expansionist politics. The supporters of this military politics, of expanding Israel’s borders at the expense of Palestinians, call traitors critic Jews. And media insistence on terrorist attacks -deplored by most Palestinians-, combined with the omission of the permanent reign of terror on Palestinians, give to the world a very distorted of the terrible situation endured by civilians. Nobody would suffer it, specially not those who argue in favor of Israel. To know the verified data on the number of Palestinian and Israel deads, you can check B’Tselem – The Israeli Information Center for Human Rights in the Occupied Territories. In this blog we aim to offer an overall view of the situation in Palestine in three posts. The first one, this, consists of a selection of 13 specially enlightening documentaries on the dire conditions suffered by Palestinians. Here we can do little more than outline the main contents of these 13 films. A more detailed study will require a whole book. Two further posts, scheduled for 2017, will deal with: a) documentaries on the many different currents inside Israel, including radical Zionism, the supporters of the idea of creating a “Greater Israel” (which implies the ethnic cleansing of Palestinians) and the pacifists and advocates of a Two State solution -an Israeli one and a Palestinian one-, able to coexist, if not to live together, in this wretched part of the world, and b) documentaries on the general story of the conflict, begun in 2017, a century ago. In the selection of the three posts documentaries, two articles and two webs have been vital: The top 10 documentaries about the Israel / Palestine Conflict, by Tim Hjersted; 11 documentaries you need to see to understand Palestine, by Noha medhat; Films about Palestine, by Palestine Solidarity Campaign, and Palestinedocs. 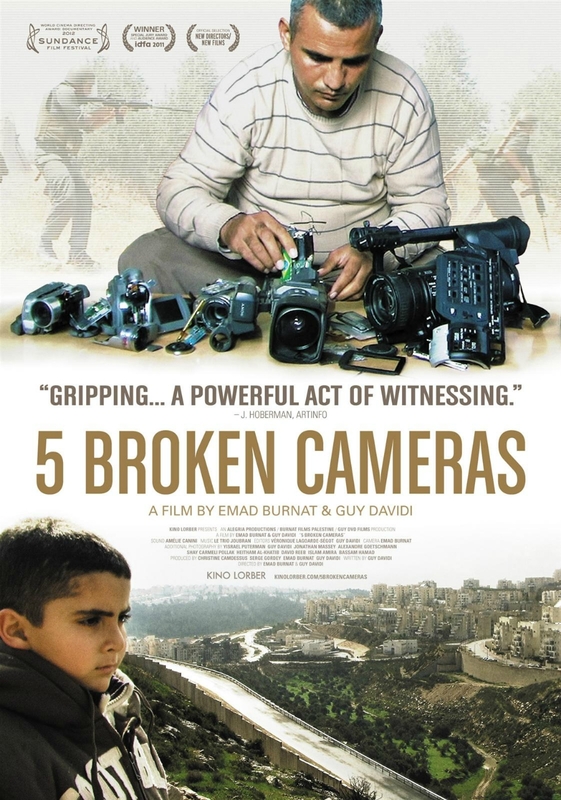 5 BROKEN CAMERAS, Emad Burnat and Guy Davidi, Palestine, 2011, 90 min. Emad Burnat,Palestinian peasant in Nilin, West Bank, buys a camera in 2005 when his fourth son is born. He wants to record his growth along with the daily life of their family. However, in the West bank there’s no private family life, since the dire conditions make it necessary to be an activist even if reluctantly. The home movie turns into village movie, for over five years Emad will record his neighbors’ pacific protests against violent Israeli settlers’ illegal intrusion in their fields, as well as the also illegal construction by Israel of a wall separating the Jewish settlement [with the stolen land] and the plundered village. Through these recordings we see the unarmed villagers’ non violent resistance to the heavily armed Israeli soldiers and the ultra-orthodox settlers full of rage against them. Emad records the daily abuses of occupation, and as time goes by he becomes aware of his growing importance as witness. He realizes that through his images the world will know what happens in his village. This conviction will give him courage to be in the first line of action and film soldiers’ and settlers’ assaults to peasants. Even though occupations forces break up to five cameras, he will go on recording, capturing, giving witness. Israeli filmmaker Guy Davidi will help him to edit a structured film with the fragments of these five years of resistance. Images and sounds are not commented on by any narrator or conductor, since they are eloquent enough to lay bare brutality. But in spite of such violence, there are still moments of humanity, friendship and love among Nilin people, signs of life, like those plants that somehow manage to emerge through the cement and the tar that would kill them. BUDRUS: IT TAKES A VILLAGE TO UNITE THE MOST DIVIDED PEOPLE, Julia Bacha, Israel, 2009, 70 min. This film achieves the feat of giving a positive message of hope from a desperate situation of occupation, spoliation, and land theft by Israeli settlers and soldiers from a little Palestinian community, Budrus, in West Bank. So, the onset is quite similar to that of 5 Broken Cameras. And similar is the incredible people’s resilience, their strengh to maintain non-violent resistance. However, demographic and ideological complexity in Budrus makes things a little more difficult. Ayed Morrar, a man from Budrus, realizes that the only way they can oppose Israel army is through peaceful means. Moral integrity is the only field where Palestinians are stronger than Zionists, who are hugely superior in military and economic terms. Ayed manages to convince his neighbors to resist the invaders through non-violent disobedience. In this manner, Al Fatah and Hamas members, usually in favor of armed struggle, join Israeli pacifist activists to avoid Budrus being destroyed by excavators and bulldozers that try to lay waste to their land before handing it to the settlers. A vital, unexpected support comes from Ayed’s 15-years-old daughter, Iltezam, who becomes the leader of a resistant women group. She is so brave that she even risks her life when she gets inside a hole being made by an excavator to prevent it going on destroying the land. Women’s involvement in politics and resistance is an achievement so surprising as the usually opposed Al Fatah and Hamas pacific collaboration. Israeli pacifists show that it is possible to interrupt the assaults and land grabbings. Many of these pacifists went on supporting other villages in Occupied Territories after Budrus. ARNA’S CHILDREN, Juliano Mer Khamis and Danniel Danniel, Israel, Palestine and Holland, 2004, 84 min. Jenin, West Bank, a refugee camp which in 2002 suffered intense Israel bombardments which killed many unarmed civilians and destroyed dozens of houses, in the so-called -by Israel- Operation Defensive Shield. Some time before, in 1999, Arna Mer-Khamis, Jewish Israeli peace activist and mother of one of the two filmmakers, created in this already hard-hit camp a children theater company, in order to help the young ones to get partially over their ordeal through symbolic and artistic representation. Drama gave them the chance to embody characters much different from themselves, and also, through psychodrama, to exorcize their traumas. Arna died from cancer before the 2002 assault. And war brutality destroyed the positive effects symbolic representation. Two boys from the company were killed by Israeli bullets, and a third committed a terrorist suicide-attack in Hadera, in which he killed four women before dying. Two other boys from the company were imprisoned. Arna’s son, the director, was killed in 2011 by masked attackers. The film shows the devastating consequences of both apartheid and bombardments against civilians, how the pacifist task of Arna was shattered by the killing assault of 2002. LIFE IN OCCUPIED PALESTINE, Anna Baltzer, USA, 2009, 59 min. This is the only film in this post which gives general context for the situation in Palestinian Occupied Territories, against what was said in the presentation -that this post was concerned only with the Palestinian suffering, and that the overview was reserved for another post. It is included here because of his high moral value. The film-maker, an American Jewish and pacifist activist, spent some months in the West Bank and discovered in person the dire conditions of daily life for Palestinians under Israel apartheid. Anna Baltzer shows -as many other people- that Jews are not necessarily Zionists, nor supportive of the colonialist project of the Great Israel, that being against Israel military assaults doesn’t mean, at all, to be anti/Semite. It means only to be in favor of human rights, brutally violated by violent Zionists. Apart from its informative and introductory aspects -with many historic news, maps and other educational devices-, the most interesting are the images -photographies, videos- taken by Anna Baltzer in her personal journey. They show the lack of the most basic things -food, water, electricity, right to mobility-, the checkpoints through which Israeli soldiers make Palestinians pass every day as they try to go to their jobs, or to hospitals, or to visit relatives, checkpoints where they have to wait every single day more than four hours just to be admitted. The checkpoints not only humiliate Palestinians, steal their existences in a daily basis, make them lose their jobs and prevent them from receiving health care when they need it: they are used to show the Palestinians that Israel has absolute power over their lives, that it can decide arbitrarily whatever it wants to do with them. In spite of all this, Baltzer is able to shed a positive light. She tells about the solidarity movements in Israel and over the world. She says that Palestinians don’t need our pain nor our rage, but support and help. And she shows the ways to give this help. FLYING PAPER, Nitin Sawheny and Roger Hill, USA and Palestine, 2013, 71 min. Gaza Strip children forget for a while the anxiety of being in an open-air prison by flying kites. In this small territory of 45 m2, one of the most densely populated areas on Earth, closed by fences and checkpoints where Israeli soldiers decide who can go out and who can’t, the only way to move freely is to fly kites in the sky. The making and use of home-made paper kites has become a cultural tradition and an identity sign. In 2010 those children, helped by UN personnel, decided to make a Guinness World Record, by making to fly as many kites at the same time as nobody in all the history of mankind had managed to put in the sky. Flying Paper focuses on the preparation of this great event, specially in the refugee camp of Jabaliy, the biggest and the most populated in Gaza Strip. Abeer, a 16 year old girl who wants to be a journalist, describes life in the camp while informing about the progress of the kites making. She says that, in spite of all the scarcities and abuses, the camp people have a feeling of solidarity, of fraternity, maybe necessary just to survive physically and morally. Children and teenagers are the main characters in this film, because of his vital spirit has allowed them to get beyond the brutal, atrocious experiences they have gone through at such a tender age. On Thursday 29 July 2010 children and teenagers from Gaza Strip met at Waha beach to fly 7.500 kites, or just to see them in the sky. They set the world record, of course, and expressed their wish of peace and freedom. On 29 July 2011 they set the record again, when 13.000 children flew more than 12.000 homemade kites at just 1 kilometer from Israel border. 80 % of the 1,7 millions of Gaza Strip inhabitants live with less than 2$ per day, all of them are deprived of fundamental rights and basic natural resources. Gaza Strip children and youngsters gave a lesson the world should never forget. WHERE SHOULD THE BIRDS FLY, Fida Qishta, Palestine, 2013, 61 min. The beautiful title -a line by Palestinian national poet Mahmud Darwish (1941-2008)- announces a film quite shocking film on the slaughter perpetrated by Israel on Gaza Strip in December 2008 and January 2009, in the called (in the Israeli side) Operation Cast Lead or (in the Arab world) the Gaza Massacre. The Israeli justification to launch a massive assault against civil population was the necessity of stopping the Qassam Rocket and mortar fire thrown by Hamas against the souther Israeli communities. However, the verified data offered by B-tselem -1398 Palestinians, the vast majority of them civilians, from which 344 minors, killed by Israeli soldiers; 6 soldiers i 3 civilians Israeli killed by Palestinians- are telling about the conflict. Filmmaker Fida Qishta, born in Rafah, Gaza Strip, who in 2013 was 26 years old, documented the havoc made by the military assault on her land and people. The film shows the Gaza massacre. We see images that won’t will be easily suppressed from memory: killed children, teenagers with shrapnel embed in their flesh, dismembered bodies. We see bulldozers demolishing homes, high tech war planes throwing phosphorus bombs against civilians, an Israeli war ship shooting at a boat of poor fishers who only tried to feed their families. We listen to a girl who tells how her family was killed in cold blood, and how she found them with shattered heads, after the impact of bomb and bullets. We see a man looking for his son among the ruins. The visual witness of this film, like those of many others, should put an end to the debate on the conflict. There is a side armed with cutting-edge technology that attacks brutally unarmed civilians. The suicide assaults from Palestinians in Israel are a desperate reaction to this systematic operation of ethnic cleansing. TEARS OF GAZA, Vibeke Lokkeberg, Norway and Palestine, 2010, 90 min. Images recorded by anonymous Palestinian cameras show the brutality of Israel bombings in Gaza Strip in 2008 and 2009. These pictures are only complemented by those taken by the very few international journalists who were able to enter Gaza during those punishment operations against civilian targets called Operation Cast Lead or, more properly, Gaza Massacre. Against the military savage aggression, the Palestinian civilians’ survival capacity is surprising. Living in tents or in ruined, roofless, wallless houses, deprived of food, water, and electricity, having seen the killing of close people, Palestinians strive to get ahead in the most adverse circumstances. We even see the havoc made by bombs in hospitals, a place which should be the last refuge, but which isn’t respected by attackers. Unlike other films mentioned in this post, this one can’t set much against bloodthirsty cruelty. It shows it as it is, without palliatives. It makes spectator watch directly violence and abuse, to watch the unwatchable. It doesn’t add any comment to images and sounds because they would be redundant and useless. But maybe the survival of the Gaza people is in itself a victory. DEATH IN GAZA, James Miller, England and USA, 2004, 80 min. After an initial section set in West Bank and another one in different points of Gaza Strip, this film sets in Rafah, on the Egyptian border, where most of the film takes place. It follows two boys and a teenager, 12 years old Ahmed and Mohammed, and 16 year old Najla, in their daily life surrounded by soldiers. Violence and threat mark all their activities, even their games, which have ceased to be such and have become fight – they throw stones and homemade explosives against armored vehicles. In their dire condition of military occupation, school turns into a group therapy center, where teachers try to reduce the deep emotional impact that armed assault leaves in children and teenagers. State violence create, as counterattack, individual terrorism, suicide martyrs who kill and die in the name of Palestine. This answer to a desperate situation -which most Palestinians disapprove because it takes away their moral legitimacy in front of international community and provides Israeli army with more arguments to go on bombing and shooting- appears in the film in the story of a boy who dies as a martyr to avenge the death of his family. Another death during the filming was that of its producer and director, James Miller, by an Israeli soldier. This death is incorporated in the film, and is described by the narrator. The second director killed in 13 films. MY NEIGHBOURHOOD, Julia Bacha and Rebekah Wingert, Israel, Palestine, USA, 2012, 25 min. Jerusalem was divided in 1949 by the “Green Line” in West Jerusalem, predominantly Jewish, and East Jerusalem, predominantly Palestine. But in the last years Israeli settlers have been evicting Palestinian families from their homes in East Jerusalem and occupying them by force, with the support of Israeli Government and police. The Zionist plan is to empty the East part from its legitimate inhabitants, to vacate it, in order to turn it into an all-Jewish area, the capital of the Great Israel. Palestinian non-violent resistance has to face armed forces and violent settlers who chase away old people and children without any respect. Budrus filmmakers made this documentary to show the sheer brutality of Israeli occupation. But, as in Budrus, they manage to send as well a positive, encouraging message. Thousands of Jews from West Jerusalem have joined Palestinians from the East section to defend their homes through weekly demonstrations. They have achieved to let the world know about this violent practice of evacuation and eviction. These supportive Jews have to face the insults of the Zionists, police repression and regular arrests. In spite of all these hardships, they go on with their deeply ethical action, and light a flame in a dark night.All the process of Zionist assaults and solidarity of some good Jews is seen through a boy’s gaze, Mohammed El Kurd,whose family has been evicted. His initial hatred against all the Jews is nuanced when, to his surprise, caring Israelis people arrive to his neighbourhood. When he grows up, Mohammed wants to be a lawyer specialized in human rights and to give back the homes to their legitimate owners. PROMISES, Justine Shapiro, B.Z. Goldberg and Carlos Bolado, USA and Israel, 2001, 106 min. In 1997, 1998, and 2000 -periods or relative calm- two of this film directors, Shapiro and Goldberg, traveled through Palestine communities, an Israeli settlement in West Bank and some areas in Jerusalem. They wanted to know Palestinians and Israeli children, and to discover their feelings about violence, war, peace and the Other. They met 7 children, of both sides, and they asked them about their lives and expectations. Although all the 7 children live at only 20 minutes’ distance from one another, they are in different universes. They lead a rich life in West Jerusalem and in the settlement, a deprived life in refugee camps. They experience the contradiction of growing up as a person and being imposed society’s hatred. Promises isn’t an easy, comforting film. In the interviews surface many already rooted animosities. Shlomo is an ultra-orthodox kid who studies the Torah 12 hours a day, Moishe is an far-right settler who had a friend killed by a bullet, Palestinian children have seen friends and relatives being killed and imprisoned. Most of them hate the other, the adversary. Surprisingly, two twin Jewish children from Jerusalem decide to travel to the West Bank and know the Palestinian children, who can’t go inside Israel because the army won’t allow it. They spend a day together just playing and talking. Throughout this day they discover both insurmountable differences and chances to correct cultural clashes. Promises is an enlightening experiment on what anthropologists and philosophers call the Other. Here we could say the radically Other. The film ends with an epilogue, two years later than the previous facts, in which the children, now 13 and 15 years old teenagers, reflect on the experience of knowing the Other, which seldom happens in the Middle East. But the feelings aren’t much good, it doesn’t seem the conflict can be easily ended. PERMISSION TO NARRATE, Bir Zeit University students, Palestine, 12 min. This short film made by students from Birzeit village, close to Ramallah, in the West Bank, shows the huge hindrances young Palestinians have to get over to educate themselves. Their university has been closed by Israeli army 15 times, the longest period being of 4 years, and they are almost without any funding to get material and books. The University existence is in the most absolute uncertainty. Israel and the United States make as difficult as possible for young Palestinians to study, specially to study their country’s history and geography, brutally transformed in the 1948 war, the 1967 occupation and the military siege their people suffer since then. The intention is to erase any collective memory in Palestinian people, which is yet another modality of ethnic cleansing. HERE AND ELSEWHERE (Ici et ailleurs), Jean-Luc Godard and Anne-Marie Miéville, France, 1976, 53 min. This 1976 picture isn’t a documentary, but an essay film, an experimental inquiry about the reception in the Western world of news from Palestine. Filmamkers began to shoot in 1970, on request of the Palestine Liberation Organization (PLO). They recorded the refugee camps, and the preparation of politic and armed struggle once it had became obvious that Israel -after invading the West Bank and turning it into the Occupied Territories- had no intention to talk. Godard and Miéville went back to France with many hours of footage. But after a horrible massacre of Palestinians weren’t able to edit the images. They couldn’t make a clear presentation of a brutal situation, they didn’t want to legitimate the Israeli army atrocities by turning them into an understandable narration. They felt that what had happened was unacceptable even in narrative terms. During the following six years, Godard reflected on the images they had collected in the camps. He knew many Palestinian appearing in those images were dead, and that he, as a filmmaker, had a responsibility to them, because he could save their memory. In the end, he decided to edit the images, adding fictional, staged scenes of a French family watching news from Palestine on TV. They receive those news through a medium controled by the powerful, who decide how they must be presented. Viewers think they are knowing what happens in the world, while in reality they are absorbing a deliberate ideological discourse. The remaining film consists of an analysis of news, propaganda, and advertising reception. Of people’s relation to the world. And of the filmmakers task, that of being a bridge between recorded facts (elsewhere) and viewers (here). A film on conscience and the moral responsibility of witness. (NO) LAUGHING MATTER (BLAGUES A PART: UN VOYAGE EN PALESTINE), Vanessa Rousselot, 2010, Palestine and France, 54 min. A different perspective to enter Palestian’s life and inside. It is an attempt to find out if there is, and how it is, Palestinian humor. The young filmmaker (28 years old when shooting the film) travels the West Bank -Nablus, Bethlehem, Ramallah, Hebron, refugee camp of Deheishe-, talks to Gaza Strip through Skype -since she can’t get a permit to enter the Strip- and goes to the Israeli city of Haifa, to ask Palestinians to tell her jokes. That’s it: could you tell me a Palestinian joke? Her aim is to find out if, in spite of all the tragedy, of daily life dire condition, they still keep a sense of humor. Humor is conceived here as vitality, as life energy. While there is humor there is a wish to live. To find out if there is a Palestinian humor is to find out if Palestians wish to go on living in spite of the severe punishment they are suffering. And yes. Although the first reaction of many interviewees to the question about jokes is of bewilderment -our situation doesn’t lend itself to jokes, or our situation is itself a bad joke-, Rousselot manages to find a critic, or resigned, or tender humor: Palestinian humor has many sides and shades. The important is the existence of this humor, a clear sign of resilience and survival instinct. My favorite joke in this film is a true story. An old Palestinian lives alone and has a son in an Israeli jail. The man wants to plant potatoes, and sends a letter to the son asking him for advice about how to work the land, since he is too old to plow it by himself. The son writes back asking his father not to till the garden, because he has hidden some arms there. Israeli soldiers intercept the son’s letter, and the following day many soldiers dig and sift the garden in search of the arms, but they can’t find them. The father writes to the son: “The soldiers stirred all the land and didn’t find the arms. What should I do now?”. The son answers: “Now you can plant the potatoes. It was the only way to help you that dawned on me”. It was an excellent idea to look for the Palestinian humor and vitality. Palestine needs living people, not dead martyrs.